Our new AG7-BTN is an old classic with a stylish new look – We’ve taken our time-tested AG7 Original Astronaut Space Pen and plated it in sleek black titanium nitride, increasing its resistance to scratching and giving it an intriguing, somewhat stealthy appearance. In 1967, after over two years of rigorous testing by NASA, the Space Pen was selected for use by the astronauts of Apollo 7 and has been used on all manned space flights since then. The design of the Original Astronaut Pen has not changed in over 44 years, and the pen that you buy today is exactly the same as the one taken to the moon in 1969. All Astronaut Pens are proudly produced in the USA! Each is made of solid brass with hard chrome plating, giving it a solid feel in your hand as you write. They also feature a unique clicking mechanism that extends the point via the button on the top, with a release button on the side to retract it. This side button has a substantial sound & feel to it, helping to ensure that you will always remember to retract the point before sliding the pen back into your pocket. 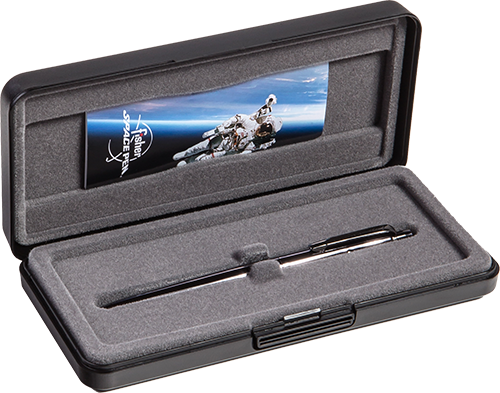 Astronaut Pens have been used on all NASA Apollo and Space Shuttle missions, the International Space Station, Russian Soyuz and MIR space flights, the French ARIANE Space Program, and the Everest North Face Ski Expedition.